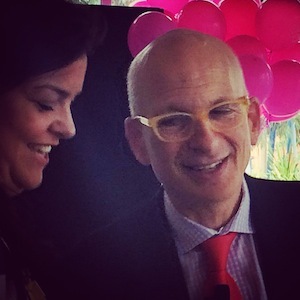 Recently I had lunch with Seth Godin courtesy of my good friend Bill Jennings. I’d like to say it was just me and Seth and… It was in a room with 300 others at a Business Chicks event in Melbourne. As usual for me watching a live presentation I’m always tracking both ‘how’ they do it’ and ‘what’ they talk about. In this post I’ll share the three most powerful things I took away from Seth’s presentation. And, in a second post I’ll share my thoughts about his presentation style. One of the keys to Seth’s work is his remarkable ability to say profound things in simple ways. He does it everyday in his blog and he also lives it in his presentations. This statement: “people like us do things like this…” sums up his view on what makes a tribe, a movement and a community. It’s also the fundamental first questions for anyone in business. Who are people like us? What specifically do people like us do? If you know whom you want to work with and what appeals to them, then you’re well on the way to building a successful business. If you don’t know who and what they like, then you’re running a business with your eyes closed and your ears blocked. Not good. 2 What change are you trying to make? The second fundamental question to ask and answer is this: What change are you trying to make? Notice, the question doesn’t say ‘What product or service should I create?’ This is a big picture question, it’s your mission, vision, change the world piece. And, this is ultimately what you’re building and selling. And, it’s ultimately what you’re potential customers and clients are buying into. This is also the key to the manifesto process that I’ve been working on. Once you know whom you want to work with and what impact you want to make on the planet, then we need to take action. And, the key action is to be a leader to others. Without leadership we only have ourselves. With leadership we can involve, engage and inspire others to join us on our quest. Ultimately, with others it’s possible to achieve our goals. Love to hear your thoughts about these three ideas. I’m already rethinking and redefining my business as a result. It’s a simple framework that could force a powerful shift in what you do and how you do it.